Many have proclaimed the obsolescence of the aircraft carrier in the face of modern weapons. I've previously discussed the threat to aircraft carriers from missiles, both cruise and ballistic, and why neither is as effective as some pundits have claimed. However, the last great threat, from the submarine, is probably the greatest danger to surface forces. Modern submarines can be divided into two categories, nuclear attack submarines (SSN) and diesel-electric submarines (SSK), with very different threat profiles. The SSN is probably the greatest threat to the carrier, and the only real competition for the title of the modern capital ship. It has the strategic and tactical mobility to hunt a carrier on the open sea, and unlike any other weapon, it has a good chance of reaching a carrier undetected and unattacked. Only 6 navies1 currently operate SSNs, and only the USN operates more than a dozen. Stealth in the form of silence is the defining characteristic of the submarine, and this shapes their operations. The best place for an SSN to be is deep and slow. Coming close to the surface exposes the submarine to a lot more sensors, while high speed makes noise and degrades sonar performance. The usual tactic is to sprint and drift, listening between high-speed transits. US and British submarines are significantly quieter than their opposite numbers, and the best estimates I have of the performance of the Chinese Type 93 submarines puts them at about the same noise levels as the early US Los Angeles class SSNs of the mid-70s. The water that protects submarines is a double-edged sword. It also makes it very difficult for a submarine to see what is going on around it, or to communicate with the outside world.2 And just like missiles, submarines need to know where the carrier is before they can attack. A submarine at periscope depth3 can communicate via satellite, but this requires the submarine to come close to the surface and slow down, so it’s not something submariners want to do anywhere near the enemy. Practical sonar ranges are a very complicated subject, but I’d estimate that a submarine would need to be steered to within 100 nm or so of the carrier to be able to detect it and close independently. And as it closes with the carrier, it has to be careful. The CVBG will be on the lookout for submarines, and it will be doing everything it can to make their lives difficult and short. The resulting game looks a lot like the hunt for the carriers.4 During the Cold War, the biggest threat to US sea power was the Soviet submarine fleet, and one of our main weapons was SOSUS. This was a network of very sensitive fixed sonar arrays placed in choke points around the world, to provide broad targeting data to various ASW5 forces. These forces would then precisely locate and destroy the submarines. SOSUS still exists, and has reasonable coverage anywhere the US is likely to face SSNs. Attacking SOSUS targets is a specialty of maritime patrol aircraft like the P-8 Poseidon. Some sectors may be assigned to US SSNs updated via satellite, which are slower but have greater staying power. Even if the US cannot manage to attack the submarine using other forces, the CVBG is warned and can either take evasive action or try to kill the submarine using its own weapons. The carrier has formidable defenses. Sometimes, submarines are attached, although the communication problems are still present. 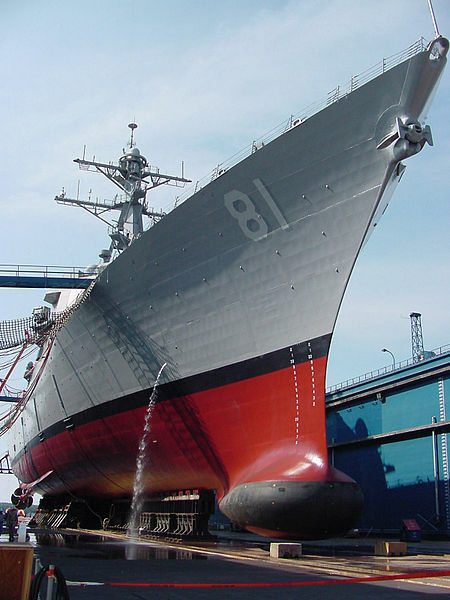 All US CGs and DDGs carry at least a bow sonar, and many have towed-array sonars as well. One or more of them might be assigned to do sprint-and-drift of its own, to pick up any shadowing submarines. Both carrier and escorts carry ASW helicopters, which will be dispatched to investigate any contacts. A hostile submarine will be localized and then attacked by either VL-ASROC6 or a helicopter-dropped torpedo. So how close does the submarine have to get before it fires its torpedo? The wiki article for the Chinese Yu-6 lists the range as 26 nm. Unfortunately for the submarine, it’s going to have to get a lot closer. Torpedoes are not that much faster than their targets. The Yu-6 is capable of 65 kts in attack mode, but the range figure is for cruise mode, which doesn’t have an associated speed. Even a 65 kt torpedo is only about twice as fast as a carrier, and the sound of the torpedo being fired is enough to alert any ship with a live sonar operator.7 This means that the target ship is likely to be running away, and the submarine has to close to within half of the effective range before launch. Furthermore, the target and its escorts are likely to counterattack, forcing the submarine to evade and cut the torpedo’s wires. A torpedo has limited space for sonar, and without guidance updates from the launching submarine, it can be evaded. All of this is likely to limit submarines to launch ranges of 8 nm or less. Or can they avoid this by using missiles? Unfortunately, this is not likely to be a healthy choice. At best, an SSN might be able to fire 18 missiles in a single salvo.8 Even with the benefit of popping up close to the target (which requires going through a lot of those same defenses they’re trying to avoid), this is unlikely to be enough. 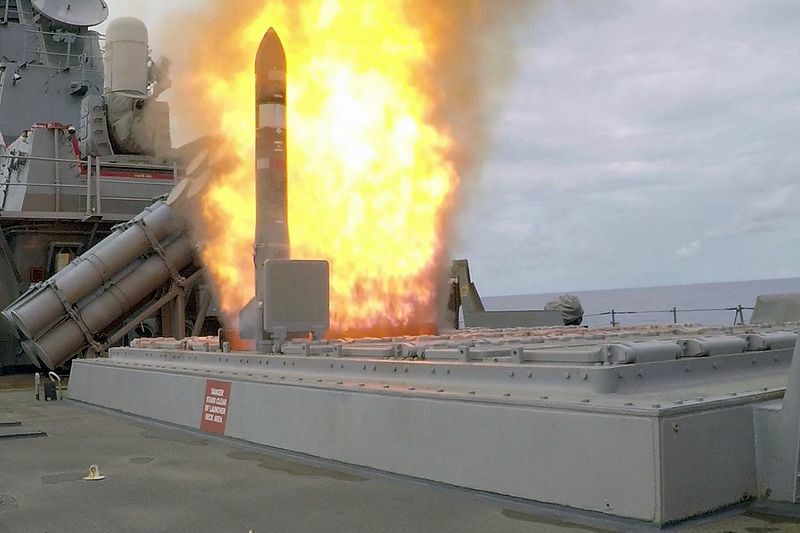 Launching missiles is extremely noisy, and Aegis is set up to take cues from sonar. The missiles will likely be shot down, and the patch of sea the submarine launched from is not going to be a safe place. Diesel submarines present a very different threat. While on batteries, they are nearly silent,9 but the low energy density of batteries limits range. The Russian Kilo class has a range of 400 nm at 3 kts, but only about 13 nm at its maximum speed of 21 kts. They can recharge the batteries by coming to periscope depth and snorkeling, but this is fairly loud, and makes them easier to detect by other means.10 SSKs completely lack the strategic and tactical mobility of SSNs, and have been described as mobile minefields. That said, minefields are still dangerous in shallow or confined waters, and SSKs are cheap enough that many powers have them.11 In the open sea, a CVBG is in very minimal danger from SSKs. 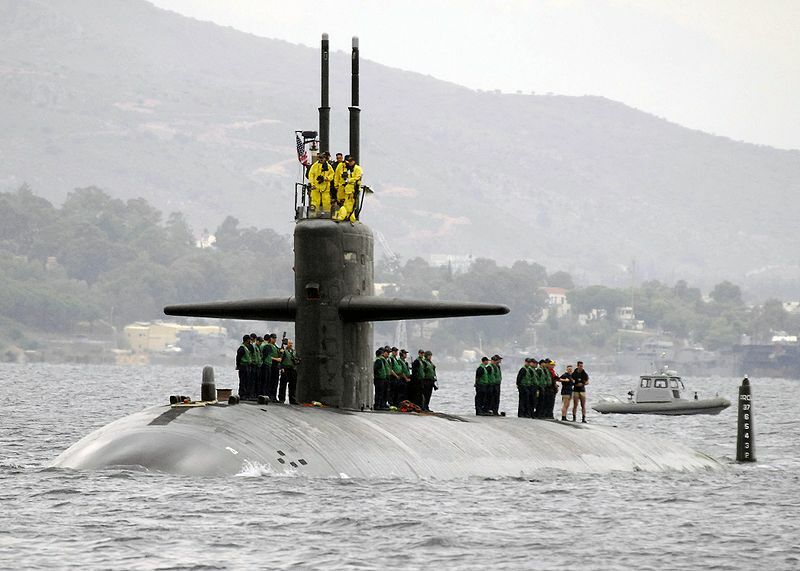 In a choke point like the Strait of Hormuz, SSKs are a serious threat, but one that the US takes measures to deal with. ASW is a mysterious field, and I’m less willing to put hard numbers down here than I am on missiles. However, we can compare the threat we face today with that of the 1980s, and the results are positive. At the height of the Cold War, Russia operated a fleet of over 60 SSNs, and the US believed it could fight and win the war against them. They have about a dozen operational today,12 while China has 10. I also believe that signal processing has improved faster than submarine quieting, particularly on the part of our enemies. The picture isn’t quite as rosy on the SSK side. Sonar performance in shallow waters, particularly places where you have different bodies of water mixing, is often very poor. This is where most ASW research in recent years has been going, although the results are obviously classified. Improvements in unmanned underwater vehicles offer hope in this area, as do new sonars and better signal processing. This whole area is fantastically complicated, and I don’t have the information to make firm predictions. That said, there is serious concern in the US undersea warfare community today about the readiness of the fleet for serious ASW. Sonar technicians spend more time manning machine guns to keep away small boats than they do honing their craft. There are signs that this trend is going to reverse, and we still maintain a solid foundation in ASW, but the submarine is by far the greatest threat to the fleet today. I certainly know which side I'd bet on, in a race between mechanical and information technology run between the 80s and 2018. I was going to push for citation that launch transient is necessarily audible, and ask if Russia and China don't have swimout torpedoes. But if the bound on passive sonar performance is information technology, I wonder if their subs can operate unheard within torpedo range at all. I’d sort of forgotten about swim-out torpedoes when I wrote that, actually. Good catch. But torpedoes are generally louder than submarines, particularly fast torpedoes, so the risk of the target running and cutting your range is pretty high. I can’t put firm numbers on it, but everything I know of points towards the effective range of submarine torpedoes being around 10 nm. and the only real competition for the title of the modern capital ship. What about SSBNs? Obviously they're not used for traditional naval purposes in the sense of sea control or commerce raiding or whatever, but they're enormously expensive and can project power worldwide even while at the dock. I'd define the capital ship in terms of sea control, so SSBNs obviously fail. They're strategic forces, and at least in western thinking, not really on the board so far as naval warfare is concerned. (The Soviets thought rather differently, but that's a matter for another time.) Insisting on a rigorous separation of power projection and sea control is usually a mistake, but an SSBN itself doesn't directly attack naval targets, so I'd rule it out. You've mentioned that SSKs are essentially mobile minefields, and thus most effective in confined spaces and shallow waters. However, it seems to me that the obvious answer to this is more mines! Particularly in littoral operations, spreading a lot of CAPTOR type mines would be cheaper and easier than having an equivalent submarine force. To be sure, this would be a defensive tool only, but it seems like it would circumvent a lot of the problems that you've identified in killing a carrier by more traditional means. However, it seems to me that the obvious answer to this is more mines! Particularly in littoral operations, spreading a lot of CAPTOR type mines would be cheaper and easier than having an equivalent submarine force. To be sure, this would be a defensive tool only, but it seems like it would circumvent a lot of the problems that you’ve identified in killing a carrier by more traditional means. Interesting idea, with a couple problems. First, the sea is really, really big. Even a relatively immobile SSK has a much bigger reach than a CAPTOR does, because it has decent sonar and the ability to move. If it picks up the target an hour out, it has to be within 12 miles of the target's course to be able to successfully engage. A CAPTOR, because of sonar limitations, is probably no more than a third to a quarter of that. And covering all the areas you might want to protect this way will get really really expensive. The mines need to be supported and maintained, and that adds up quickly. Make them more capable, and you drive up the cost. The second problem is command and control. A submarine can act based on tactical judgement of the crew and a fairly short set of orders over the radio. A mine can't. You could tie each one back to a shore-based control center, but that's now a main target of the other side. Or you can hope that your advanced tactical algorithms are good enough, and you don't accidentally sink a merchant ship that happened to sound just a bit too much like an enemy destroyer. A couple of problems. First, if you've got something moored at 3000' in the middle of the ocean, it's going to be very easy to pick up on sonar, and it will be killed. Second, the other guy will be monitoring you placing these, and might well take action against them. Third, this kind of activity in the deep sea isn't easy. SOSUS took a lot of effort to set up and maintain, and SOSUS hydrophones are very simple compared to something like this. Fourth, the same C2 problem I mentioned above. Fifth, the ocean is really big. You'd need several hundred of these mines for any reasonable barrier, and the USN only has maybe a thousand Mk 48s, at least according to wiki. Interesting idea, though. It's just that open water is too big. Or you can hope that your advanced tactical algorithms are good enough, and you don’t accidentally sink a merchant ship that happened to sound just a bit too much like an enemy destroyer. In the event of a real shooting war, I don’t see why this is necessarily a bad thing. Sinking commercial traffic isn’t as immediately effective as sinking naval vessels, but it does two things for you. First, it strikes the fear of mines into the enemy, so they either avoid the area or have to painstakingly minesweep it, which hampers their tactical freedom. Secondly sinking commerce is (potentially) more effective in the long run, assuming of course that the war remains conventional long enough for that to make a difference, rather than going nuclear. The fact that you shot a merchant ship means they now have a datum on where you mined, but this is much less important for mines than it is for submarines or other vessels. First, if you’ve got something moored at 3000′ in the middle of the ocean, it’s going to be very easy to pick up on sonar, and it will be killed. I should have been more clear. These deeper CAPTORs would still be laid on the bottom. Current CAPTORs have a max depth of 1k feet (according to Wikipedia, so you know it has to be true! ), which means that if the CVBG can stay 10nm from the 1k line, they’re essentially safe from that threat. If you can move the placement line out to 3k or 10k, it is at least theoretically a much larger threat. As you say, just having them floating in mid-water would make them very easy to counter. Third, this kind of activity in the deep sea isn’t easy. SOSUS took a lot of effort to set up and maintain, and SOSUS hydrophones are very simple compared to something like this. Fourth, the same C2 problem I mentioned above. Fifth, the ocean is really big. You’d need several hundred of these mines for any reasonable barrier, and the USN only has maybe a thousand Mk 48s, at least according to wiki. Depending on how they’re used,* I agree that this seems to be the biggest problem. However, I think you can counter that to some extent by throwing a lot of concrete and steel dummies with the same external characteristics in the ocean. Also, I don’t think you need to have a totally impenetrable barrier, so much as one that hampers the freedom to maneuver of the carrier groups, and makes them scared. In doing more reading and looking about at some charts, I think the biggest problem is actually the lack of ocean between 1k and 5k in depth. It seems like most of the ocean shelves drop off fairly quickly after 600-1000 feet, down to 10-12k,** so moving from 1k to 5k as a critical depth wouldn’t actually get you much extra potential area. All that being said, mines still seem like potentially promising way of keeping a CVBG on its rear foot, as the cost of placing mines versus defending against them is so highly asymmetric. *Defensively, they would be close enough to their “owners” that I think it would also mitigate some of the C2 and deployment issues. **For instance, the Red Sea is super shallow, almost to the point of being totally accessible in normal SCUBA gear, but once you turn the corner into the Gulf of Oman, it rapidly drops to 10k feet. Much of the Russian Arctic coast is barely 300′ deep for quite a ways out, and so on. Also, sorry about not breaking out your quotes versus my new writing. I tried to, but apparently didn't get the syntax right. In the event of a real shooting war, I don’t see why this is necessarily a bad thing. The problem is that laying submarine-substitute mines in the middle of a shooting war isn't really possible, because you need to be able to protect the minelayers from the enemy, who will be trying to sink them. If you just want to lay mines close to your coast, that's fine. But submarines are useful because they can go places others can't without being sunk, so the mines would need to be laid before the war. And you need to pay to maintain them, which is really expensive. though I think in the case of all out war this is less of an objection than you make it out to be, because you want to sink ~everything that’s not your own ships. Not necessarily. Even if we assume that it's an all-out war where I want to sink everything, some things are much more valuable than others. The other side is going to screen their carriers with a bunch of noisy merchant ships, and have helicopters standing by to pull the crews off before the torpedo hits. One problem of fixed defenses, on land or at sea, is that you need to cover them with active forces to prevent the enemy from just wearing them down methodically. I'm just not sure this is true. You need to keep the CVBG a couple hundred miles offshore, which means a long barrier. Expect them to have a good idea of the general area where the mines are by monitoring your activities. They might be able to go around, or punch a hole and go through. A couple of other issues I hadn't thought through last time. First, the mine would need to figure out the location of the target with passive sonar. Submarines do this, but they're greatly helped by their ability to move to get a baseline. Your mines can't, and I wouldn't be at all surprised if it was possible to make a ship sound like it was significantly closer or further away than it actually is by careful choices of engine setting and speed. Third, the sea does funny things to sound. Some frequencies are attenuated quickly. Others are bent in different ways. If I'm building an acoustic mine that's supposed to be a few hundred feet from its target, that's not a big deal, and if I have a detailed sound profile of my target, I can use that. Real CAPTOR is a bit further away, but I'd be surprised if it's more than a mile or two. More range means less information for the mine sonar (which also has to be more expensive), and makes it easier to fool. A sweep that has the short-range acoustic and magnetic signature of a carrier is hard. A decoy that sounds enough like a carrier to a mine on the bottom of the sea 10 miles away might be a very different matter. And there's the fact that some sounds are trapped in different layers, so a bottom mine might not have the same performance as a submarine's sonar. Don't get me wrong, it's a clever idea, but I just don't see it being a good use of resources. I agree that the sensor issues are non-trivial, as something operating that far from the target would probably only be able to use passive sonar, which seems like it would be easier to spoof than magnetic+acoustic+pressure or what have you. In thinking about it further, I agree with you that it's not a very good use of resources as a general idea. I do wonder though if a more well resourced opponent could do something with it, as an armed SOSUS network off the coast of China would do a lot to help their submarine force defensively. However, by linking it to shore you totally change the end product. Anyways, thanks for indulging my hypothesizing and spit-balling! Also, sorry about not breaking out your quotes versus my new writing. I tried to, but apparently didn’t get the syntax right. I went in and fixed it. The syntax I use is just a > at the start of the paragraph, although there’s some quote tag that also works. I do wonder though if a more well resourced opponent could do something with it, as an armed SOSUS network off the coast of China would do a lot to help their submarine force defensively. However, by linking it to shore you totally change the end product. That gives you C2, but I also think that the challenges of having to maintain the things shouldn’t be underrated. The sea isn’t the kindest environment, and you either have to spend a lot on engineering or haul them up every year or two for maintenance. It’s always interesting to see what people who don’t have the biases of the usual audience come up with, and try to work through the implications. What kind of advantage does a greater submersion depth give an SSN? 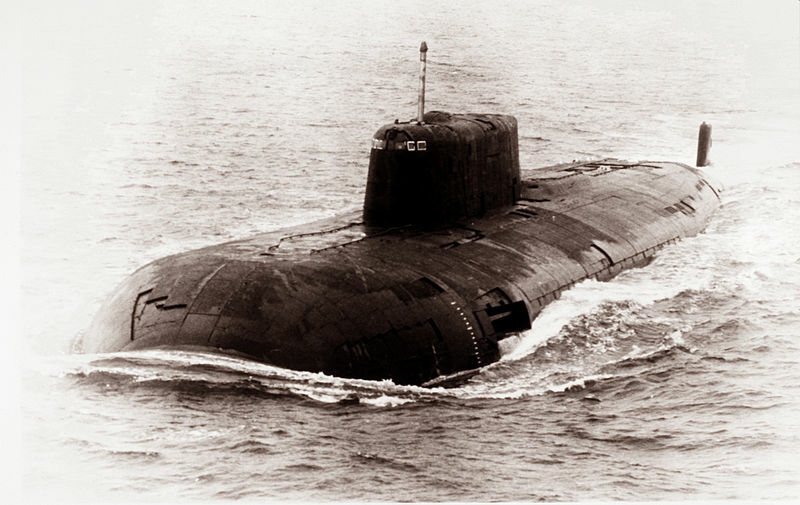 Soviet submarines generally had a greater working depth, sometimes significantly so (in the case of Mike-class boat), but what does it add to the operational capacity? Ability to make a noise-compromising dash at depth where it is invulnerable to countermeasures? Greater stealth due to more layers of water between the sub and the sonar? Some exotic way of attack, like hovering "beneath" the enemy ship and launching a torpedo upwards, while remaining on the safe depth? Actually, do torpedoes even function on the depths like this? Why don't anti-ship missiles carry homing torpedoes, a-la CAPTOR? The ASM seems to be most vulnerable on the last phase of approach, when all of the countermeasures come down on it, with the CIWS providing the last line of defense. Sudden change of attack vehicle could confuse an enemy (especially if he presumed the missile to be destroyed by countermeasures) giving the torpedo more time to zero in on the target. And since the protocol for AA defense is probably different from torpedo evasion, so it would take some time for the crew to understand what happened and switch gears. 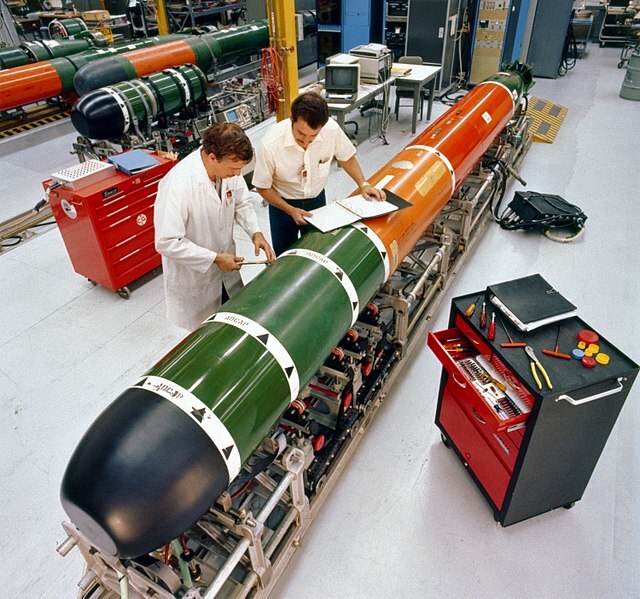 Why are torpedoes so expensive and slow to build? Wikipedia claims that there are only 50 Mk 48 torpedoes produced each year. I kind of get that basically torpedo is a small submarine, so all the same engineering problems have to be solved, but in a drastically reduced space. Are there more specific problems that have kept the rates of production comparable to those of WWII-industry? What kind of advantage does a greater submersion depth give an SSN? I’m not entirely sure why the Soviets went that deep. The Soviet Navy is a mystery, and not one I can unravel offhand. There are significant costs, and I think the US in general was more cost-constrained. Ability to make a noise-compromising dash at depth where it is invulnerable to countermeasures? Maybe, but it has to come up to launch, and the target can run nearly as fast. Greater stealth due to more layers of water between the sub and the sonar? Some exotic way of attack, like hovering “beneath” the enemy ship and launching a torpedo upwards, while remaining on the safe depth? Actually, do torpedoes even function on the depths like this? Not really. Most high-performance torpedoes use combustion engines, which have to dump their exhaust products overboard. Also, there are depth restrictions on torpedo tubes. There are ways around this, either via some very exotic reactions or the use of batteries. But the torpedo has to climb, and that takes energy and time. Why don’t anti-ship missiles carry homing torpedoes, a-la CAPTOR? It’s a matter of range. Lightweight torpedoes are quite short-ranged, and heavy torpedoes are too heavy to fit into a missile. The Mk 50 torpedo is estimated at 55 kts/14 kyrds, with an abortive version to have been 70 kts/18 kyrds. That’s going to take about 7.5 minutes to cover. The carrier can run away in that time, so you’re actually having to get to something like 10 kyrds. That’s well within ESSM range, so you’re not bypassing very many missiles. And there’s the risk of the carrier outmaneuvering the torpedo, which doesn’t have a lot of space for a guidance head. Normally, lightweight torpedoes have to be dropped basically right on their targets so they don’t run out of endurance before they find and run down the target. And you’ve made a much larger and more complex missile for a given amount of destruction, thanks to all the torpedo stuff. Overall, just not worth it. Why do we need to build more than 50 torpedoes a year? We aren’t expanding the submarine fleet, we continue to use the same basic architecture, so upgrades are adequate in lieu of new procurement, and we certainly aren’t shooting them off at the enemy. To a large extent, we build torpedoes today to ensure that we can continue to build torpedoes should one of those conditions change in the future. Experience like that doesn’t sit on the shelf well at all. If we needed to build lots of torpedoes, the price would plummet and the rate would rise. As it is, we have a cadre line, and plans to expand if necessary. Also, sorry for deleting your comment on the Ship Ride. It was an accident. Also, I remember a scene in some sort of action movie featuring a submarine duel: a submarine launching a moving decoy, akin to a torpedo, to lure the enemy torpedoes away. It seems that this idea kinda makes sense at least at some level (seeing as the homing warheads are not that good) but I have never seen any mention of such tech anywhere. Did the director of the movie simply made it up? No, that one is real. I was looking through World Naval Weapons Systems yesterday, and came across an interesting fact. Apparently, ASROC does have the capability to set its Mk 46 in anti-surface mode, and the resulting missile comes down outside CIWS range, too. That said, it's still within every other missile defense system's range, and lightweight torpedoes aren't that powerful. A different book has me reconsidering how good US ASW is today, so this post might get revised. Why? Didn't American ships blatantly run into mines during the 1991 Iraq war? Why? Didn’t American ships blatantly run into mines during the 1991 Iraq war? Princeton at least hit influence mines resting on the bottom, which are a lot harder to detect. Not sure about Tripoli. I do know that several ships were able to dodge moored mines in real time thanks to mine-avoidance sonars. And the deep ocean is a much better sonar environment than the typical littoral. Edit: Tripoli did hit a moored contact mine, but mine avoidance sonars were very new at the time (first tested during the Iran-Iraq War) and I believe that existing sonars could either find the mines as described here or could be modified to do so at the software level with minimal effort.